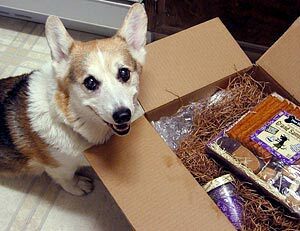 Ooh, a box from Three Dog Bakery has arrived! I have a feeling I’m not supposed to know about this for a few days. I will have to pretend that Santa brought this. I bet I can pull that off. If I can stop leaving incriminating drool marks on the box. Well, this is a first for me. We appear to be moving. From one house to another. I dont know what to make of this. Except for my first few weeks as a puppy, I have always lived at this house. Always! Do you know how long that is in dog years? I guess I shouldnt be too worried. I have been assured that all of our toys and treats are moving with us. We have visited the new place several times and I have not missed a meal yet, so thats good. We play ball in the new yard, and thats good, too. I have been told that there are squirrels in the new yard, with big bushy tails, unlike the skinny, wimpy-tailed ones we have around here, but I have yet to see them. I have also been told that sometimes there are real, actual, wild turkeys at the new house, too, but I think my folks are just making things up. Turkey is my favorite food in the whole world. I would be beside myself with joy if I could just go outside and pick a turkey. I am not entirely sure if there is some process that must take place between finding a turkey in the yard and having a turkey dinner, but I would be happy to investigate further. Oh, I guess I can try to be a trouper about moving. I will consider it an adventure and an experiment in turkey preparation.